Frequently Asked Questions - Garner & Associates Auctioneers, Inc.
Q. When do you have auctions? Q. Is the auction open to the public or do I have to have a dealer license? A. Our auctions are open to the public, anyone can register to bid. However, no one under 16 is allowed to attend the auction. A. We start our auctions at 9:00 a.m. The gate will be open at 7:30 a.m.
Q. Does the bidding start at a certain price? A. No. We don’t start the bidding on anything. We accept any reasonable opening bid. Q. Does it cost anything to register or attend the auction? Q. How long do I have to pay for my items? A. All items have to be paid for in full by the end of the auction day? A. We take Cash, Checks, Credit Cards, and Debit Cards. A. An “absolute auction” is where everything in the auction sells to the last bidder regardless of price. Q. 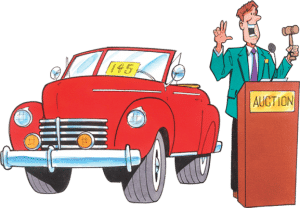 Is your auction and “absolute auction”? A. No. Some items sell with a minimum acceptable bid. We will take the last bid on the item and sell it if it meets the minimum price. However, items sold by government agencies will be sold “absolute” unless otherwise stated. Q. When can I preview the items? A. Items can be previewed on the Friday before the auction from 9:00 a.m. to 5:00 p.m. You can also register for the auction at that time. A. No, registration has to be done in person. Q. Can I bid online? A. Yes, we do use an online bidding platform with a link from our website. You will have to register with them and prequalify to bid. Q. If I have something to sell, when can I bring it to the auction? A. We accept consignments starting 2 weeks prior to the next auction. We stop taking consignments on the Wednesday before the auction. Q. What does it cost to sell something at your auction? A. We charge a commission based on the price of the item sold. It works on a sliding commission scale.